In the original report, we described the prevailing commercial model in medtech as “analogous to milkmen delivering milk in a world dominated by megastores." Our first study highlighted a number of trends—including downward pressure on prices and drastic changes in buying processes—that were squeezing medtech companies’ gross margins. In the years since, these trends have strengthened. Power continues to shift from clinical buyers such as individual physicians to institutional decision makers at standalone hospitals, centralized bodies and committees in large hospital systems and buying groups, and regional and national government agencies and private payers that control access to an entire market. In many medtech segments, a good is good enough mentality is spreading, as growing numbers of decisions are made on the basis of clinical acceptability rather than individual clinician preference. Overall, innovation productivity is in decline. In some product categories, low-cost competitors—including those from emerging markets—have grown rapidly and taken market share from established competitors. At the same time, purchasers are becoming more insistent on real-world evidence that premium medical devices create value by improving patient outcomes and reducing the total costs of care. And tougher regulatory hurdles and health technology assessments are adding to the cost of doing business. Furthermore, value-based health care is becoming more common in some markets, shifting the basis of competition even more radically for the medtech industry. The changes are spurring companies to move beyond products and toward more comprehensive value propositions and solutions that address the entire patient pathway. While these trends have been accelerating, medtech commercial models still entail unsustainably high costs. In 2012, the average medical-device company’s selling, general, and administrative (SG&A) expenses—measured as a percentage of the cost of goods sold—were 3.5 times those of a typical technology company. Our most recent analysis indicates that this gap remains just as wide. Yet prices have fallen2: the relative price premium for medtech compared with technology players has shrunk from a multiple of 1.9 to 1.6. Margins are being squeezed but few companies have taken the bold moves required to create a leaner commercial model. Our analysis is based on an updated sample of publicly listed medical-device and technology companies and comparable data from the original study in 2012. Sales force productivity across regions shows a similar picture. The productivity of US sales reps is higher than that of sales reps in Europe, and productivity in Europe is higher than in Japan. These differences, which are largest for the administration-driven sales model, are the result of several factors, including, in the US, higher prices and the increasing consolidation of institutional hospitals. The industry has also made limited progress in improving back-office operations. In general, companies still have more employees in the back office than in customer-facing functions such as sales and key account management. Compounding these problems, many medtech companies are failing to exploit economies of scale. There is still a tremendous opportunity for medtech companies to reexamine and revamp their management of back-office functions, including centralizing certain activities that are currently conducted in multiple individual countries. Our review of the industry’s commercial capabilities revealed a similar story. (See Exhibit 2.) As part of our original benchmarking analysis, more than 4,500 medtech employees rated their companies’ commercial capabilities in five key functional disciplines: sales, key account management, marketing, reimbursement and pricing, and services. On average, the participants in 2012 gave their own companies only a basic to intermediate rating. Since our survey in 2012, the picture has not changed materially. Most of the more than 6,000 employees who participated in the 2015 survey gave their companies similar basic to intermediate ratings. One noteworthy change is that priorities have shifted from sales and key account management to market access and pricing. Respondents continued to send a clear message that the capabilities of most medtech companies have not kept pace with the powerful market shifts discussed above. Some companies, however, have acted on the recommendations we made in the original study. In 2012, only one company rated its own capabilities as strong. It is no coincidence that this company has been one of the industry’s best performers in terms of shareholder value creation over the past five years. The 2015 analysis revealed a bifurcation of the industry. A larger share of companies reported improved capabilities, and it is apparent that those that have taken action are winning in the market. As Exhibit 3 illustrates, they are becoming more profitable and delivering superior shareholder value. (For a case study, see the sidebar, “A Medtech Company Revamps Its Commercial Model and Generates $1.5 Billion in Shareholder Value.”) By contrast, those that have not yet taken action face an increasingly urgent mandate for change. A leading global medtech company that sells medical devices to hospitals faced competition from a large, well-established company and new threats from low-cost players that were rapidly gaining market share. Like many others in the medtech industry, this company was stuck with a high-cost clinical selling model, and its commercial capabilities were low. Customize your go-to-market strategy and commercial model. The company started by generating deep insights about its market and customers in order to prioritize focus areas and understand how to win. It was surprising how fast commoditization was already affecting the company’s products and customers. On the basis of this insight, management fundamentally redesigned the commercial model, making it more customer-centric and agile and, simultaneously, reducing costs. For example, the company grouped its most commoditized products into a new business unit with a lean sales force but new differentiating add-on services. In all, the company reduced SG&A expenses by 8% and used the savings to fund subsequent steps in the transformation, including investments in new critical capabilities. Reinvent clinical selling. The company strengthened its selling capabilities to institutional buyers and oriented its now-smaller sales force to the highest priority customers. It also established new remote-selling capabilities to serve smaller accounts. Partner with key accounts. The company avoided bundled discounting. Rather, it developed new solutions for its most important customers to generate value collaboratively. For example, one initiative improved the recovery process for surgical patients, while also reducing the cost of their care. The company then gradually built up its key account management team. Build real marketing muscle that drives home the value of products. The company also upgraded its marketing team, making it the orchestrator of the commercial organization and delivering much stronger proof that its products and solutions were generating real value for customers. Make service a differentiator—and a source of revenues. The company strengthened its services, with an initial focus on its customer care operations. Its objective was to establish itself in its customers’ eyes as the supplier that is easiest to work with. This led to significant revenue growth. By applying the six transformational moves, the company substantially increased its sales growth, gained massive market share against its main competitor, and halted losses to its low-cost challengers. In parallel, it reduced the cost of its commercial model and back-office setup. As a result, in Europe alone, the company generated $1.5 billion in shareholder value over three years. Medtech leaders asked us what, in addition to improving commercial models, they should focus on during the next leg of the journey. Our response? Business model innovation that encompasses three promising themes: value-based health care, digitization, and low-cost products and services. In our view, value-based health care is the most pressing issue facing the indus-try. Ten years ago, Michael Porter of Harvard Business School and Elizabeth Teisberg of Dell Medical School at the University of Texas at Austin formulated a simple equation for determining value in health care: outcomes that matter to patients divided by the cost of delivering those outcomes. Since then, however, most health systems have made little progress in bringing value to health care. The denominator of the equation—health care costs—is most visible to medtech companies. After all, unsustainable cost increases around the world are the root cause of the pricing pressures the industry now faces. Still, the numerator—patient outcomes—is arguably more important. Even for routine procedures, outcomes vary from one hospital to the next. For example, depending on where they are treated, bypass surgery patients in the UK face a fourfold higher risk of dying, radical prostatectomy patients in the Netherlands face a ninefold higher risk of tough complications, and hip replacement patients in Germany face an 18-fold higher risk of a necessary second operation. It is hard to imagine customers accepting such quality shortcomings in any other industry. In this context, medtech has a clear opportunity to become part of the solution—and also avoid commoditization. The industry is uniquely positioned to help providers deliver better outcomes at lower costs. The majority of outcome variations are attributable to practice variations: health care professionals perform at different levels of competence that reflect their experience, judgment, and capabilities. Some 70% of health care costs are related to care provision (5% to 10% of costs are for medical products, and 15% to 20% are for pharma products), and, according to our research, nearly one-third of those costs stem from inefficiencies. Thanks to its innovations, therapeutic and business expertise, and deep relationships with providers, medtech—more than any other industry, even pharmaceuticals—can help improve both elements of the value equation. To capture this opportunity, medtech should aim to provide customer solutions that improve clinical practices. In many cases, physicians lack adequate data and, therefore, have no way of determining how well they are performing. Companies can help physicians and hospitals gauge their performance and benchmark it for concrete diseases and different patient cohorts. Working with many provider types in many locations, medtech companies are able to compare care pathways and benchmark outcomes and costs. In this way, they can apply internationally recognized outcome measures—such as those developed by the International Consortium for Health Outcomes Measurement—and collaborate with academia, regulatory bodies, provider organizations, and even competitors to establish outcome registries. Medtech can then determine the root causes of outcome variations and identify the levers and critical intervention points for reducing variations. And finally, medtech can help its customers apply these levers, allowing for the development of new solutions and paving the way for more outcome-based business models—even, perhaps, risk-sharing arrangements. We have seen many innovative, value-based solutions in our work with medtech companies, including programs that have dramatically increased the efficiency of care delivery and reduced costs by 20% to 30% while improving medical outcomes. Other initiatives have improved the recovery of postsurgical patients, reduced rehospitalization rates, and mitigated the complications of chronic illnesses. For some patient groups with particularly difficult to manage health problems—for example, adolescents with type 1 diabetes and patients with end-stage renal disease—medtech companies have themselves become full value-based care providers. Such promising innovations are only the initial steps in what will become a main area of business model—and product—innovation. The second theme in business model innovation is digitization, the most widely discussed topic in our interviews with senior leaders. Big data, artificial intelligence, mobile applications, 3D printing, robotics, advanced sensors, and other technologies are creating new opportunities for medtech companies. And they are also attracting new competition to the industry. We see three ways that medtech companies can use digital technology in business model innovation: strengthening the value proposition for a company’s products and services, enhancing the go-to-market model, and streamlining internal processes. Strengthening the Value Proposition. Some medtech companies are already applying digital technology to improve patient care. Medtronic, for example, has partnered with Samsung Electronics to develop a new product that integrates insulin pumps and mobile and wearable devices into a diabetes management system, allowing patients and doctors to view diabetes data remotely and adjust care plans. Among the many diabetes care examples is WellDoc’s mobile app that provides medical guidance and interventions for patients with type 2 diabetes. The app was found to be as effective as leading diabetes drugs and was the first mobile offering to win insurers’ reimbursement. Connected implants (such as those sold by Stryker and Smith & Nephew) are noteworthy examples in orthopedics. They deliver conclusive treatment results to clinicians and manufacturers, who can use the data as clinical-outcome evidence. OrthoSensor’s surgical sensors provide real-time feedback during knee replacement procedures, helping surgeons determine how best to position implants and how much soft tissue to retain. These are just a few examples. The coming years will see a wave of innovation as companies continue to develop new ways to incorporate digital technology into the products and services they sell. Enhancing the Go-to-Market Model. Digitization can help medtech companies do a better job of connecting with their customers and learning about their needs. For example, many markets now restrict sales reps’ access to health care professionals. Digital technologies can bridge this gap not only for clinicians but also for institutional buyers. Although companies have had only limited success in approaching customers in a purely digital way, the combination of digital and personal sales and marketing efforts increases access and helps companies tailor their engagement to the personal preferences of providers and purchasing authorities. For example, a remote selling team can use digital channels to reach low-potential accounts, supported by e-detailing and interactive videos. For high-potential accounts, reps can alternate between face-to-face meetings and digital communication for checking in and following up. And an online portal can complement both approaches by delivering information that customers can pull anytime and anywhere, using education modules, e-games, virtual training, and webinars. More broadly, medtech companies can use digitization to establish a direct link to patients or insurers paying for medical treatments. For example, US-based Propeller Health has developed an add-on product for people with asthma. The device, which uses a cloud-based link to connect the company directly to patients, fits onto an inhaler and records ambient data, helping patients understand which environmental factors cause symptoms. Applying digital technology to a company’s go-to-market model can have a significant impact. According to BCG research, companies can increase revenues by 2% to 3% annually. Streamlining Internal Processes. Digitization can increase the efficiency and effectiveness of business processes, including those that improve the customer experience and support sales reps in the field. Companies already use predictive-modeling tools to forecast demand and geoanalytics to speed delivery and reduce inventories. Web portals give customers an easy way to order products, transparently follow their shipping status, and return products when necessary. RFID chips and barcodes help customers track expiration dates, order replenishments, and manage consignment stock. Business models built around low-cost offerings are not new. In 1450, Johannes Gutenberg introduced the first press for mass printing. In 1908, Ford Model Ts began to roll off the brand-new assembly line. Today, low-cost business models are pervasive and have led to a massive expansion in most markets. So why is the medtech industry struggling so much to adopt low-cost models? The simple answer is that established companies have major misperceptions about what “low cost” actually means. In fact, five deep-rooted myths about low-cost business models need to be dispelled. Myth 1: Low-cost businesses have low margins. The reality is that successful low-cost players achieve even higher margins than traditional companies. In fact, margin is the only thing you should not save on as you design your low-cost model. For example, China-based Mindray Medical International, which sells low-cost imaging systems and diagnostics, has been outperforming its established competitors on growth, margin, and relative R&D investment. Myth 2: Low-cost businesses sell cheap imitations of premium products. The reality is that these business models require true innovation, which must be geared to the “bottom of the pyramid” and can even include the provision of care. Take India’s Aravind Eye Care System, which applied a low-cost, high-volume approach to cataract surgery. The company standardized processes, increased labor productivity by training nurses and technicians, and improved asset utilization by having two or more operating tables per room. Aravind also integrated vertically by establishing a nonprofit manufacturing arm to produce a wide range of low-cost intraocular lenses that meet industry quality standards. With these innovations, Aravind made eye surgery accessible to low-income Indians with treatable blindness, experiencing 60% fewer complications than the US average. Myth 3: Low-cost products are low-quality products. The reality is that although low-cost businesses typically offer a limited range of products with fewer features, they nevertheless offer solid quality and reliability. Because low-cost products are scrutinized by regulatory authorities and customers, product quality must clear a high bar. For example, Datascope, a US medical-imaging company, found that the quality of its products actually improved after it was acquired by Mindray. Myth 4: Low-cost offerings are not branded; they’re just other options in the company’s range of products. The reality is that establishing a strong second brand in a separate, standalone business can often be the right solution: it provides a strong focus and freedom to operate. For example, Smith & Nephew separated its no-frills orthopedics business into a new entity called Syncera, which aims to deliver improved patient outcomes and higher operating room efficiency at lower prices. Myth 5: Low-cost business models entail cannibalizing sales from existing customers. The reality is that successful low-cost products and services help companies access new customers and generate new demand. For example, GE Healthcare’s low-cost, portable ultrasound device—developed by a local team in China—has expanded beyond emerging markets and is now used in ambulances in developed countries. As a result, the market for that product grew to roughly $280 million within six years of its launch. In short, we believe that to avoid being squeezed in premium niches, medtech should embrace low-cost business models as a key innovation area. Starting up a new in-house low-cost division is, however, a challenging undertaking. For many companies, acquiring an existing business is a better option. Essilor International, a French manufacturer of ophthalmic lenses and equipment, is a successful example. When its traditional core product segments were threatened by low-cost imports from Asia, the company acquired a series of low-cost players—more than 30 since 2003—and became the number one low-cost player in the optical industry. Through this approach, it even improved profitability, as most of these low-cost businesses had margins at or above Essilor’s average. The health care industry is undergoing massive change. The status quo—including huge variations in patient outcomes and out-of-control costs—is not sustainable. And the medtech industry has the opportunity to play a leading role in the transformation. As our research shows, medtech has not yet made enough progress in fixing its commercial model. Companies that have embraced the six transformational moves we recommend are winning in the market and generating vastly superior value for their shareholders. Those that have not risk being left behind. 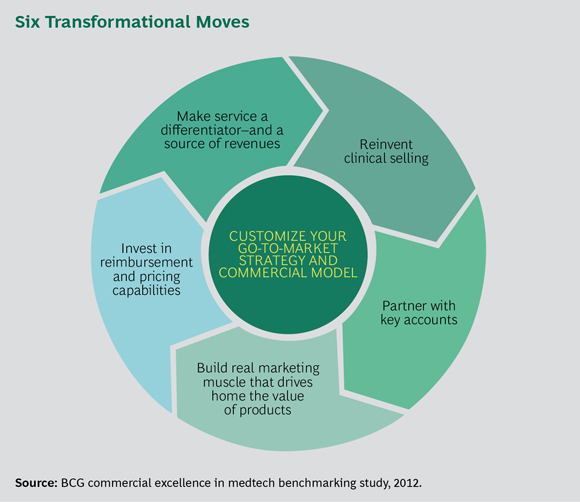 Furthermore, medtech needs to invest in business model innovation to win in the medium term. Value-based health care requires new solutions, and no industry is in a better position to offer these than medtech. The industry will be disrupted by digitization, so companies should become the digital disrupters of their own business models. And there will be a sizable low-cost segment that established players need to address. These exciting times for medtech demand visionary thinking, bold transformational moves, and new capabilities to create value for customers. Companies that get this right will be rewarded handsomely. More important, they will shape the future of health care.